Demonstration in front of the White House, Washington, D.C., Nov. 27. Click here for a slideshow of the demonstrations. Activists mobilized from coast to coast for emergency demonstrations in response to the the latest escalation of hostilities in the Korean Peninsula—the result of a policy of deliberate provocation by the United States and South Korea over the past several months. Today, the United States is carrying out new war games that threaten both North Korea and China, and is provoking the next stage of the crisis. The ANSWER Coalition will continue to send out updates and plan future actions. 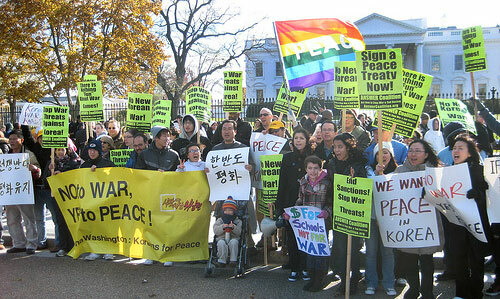 A very diverse group of people from throughout the DC Metro area, including members of BonghaWashington: Koreans for Peace and the ANSWER Coalition, gathered in front of the White House on Nov. 27 to oppose a new Korean war. The demonstrations against the escalating threats on North Korea have received widespread coverage in the media. Below is a sample of the media coverage. The event received considerable media coverage, including from CNN. Many tourists visiting the White House expressed their support, and some joined in the demonstration. Protesters gathered on Nov. 27 at the gates of University of New Mexico in Albuquerque to protest U.S. and South Korean war moves against the Democratic People’s Republic of Korea (DPRK). Many passers-by stopped to sign the ANSWER statement calling for no new Korean war. Many shoppers driving by honked and waved in solidarity, as protesters chanted "We told you once, we said before, don't provoke a Korean war" and "Defend the rights of sovereign nations, stop all U.S. provocations." A militant rally following the picket line was chaired by ANSWER organizer Chris Debonis who called for solidarity with the people of Korea: "We say no to another U.S. war of aggression against Korea. We need jobs, schools and infrastructure—not war and occupation." Amid the hustle and bustle of Times Square, protesters came out on the evening of Nov. 29 for an Emergency Demonstration against U.S.-South Korean war games and to demand an immediate peace treaty. After an hour of chanting, picketing and distributing literature, there was a brief program that included the ANSWER Coalition, the Alliance for a Just and Lasting Peace in the Philippines, the Pakistani Freedom Forum-USA, the Iranian American Friendship Committee and the International Action Center. Speakers explained the vast suffering produced by the first Korean war, how Korea was divided by foreign powers, and called on the Obama administration to stop the threats against North Korea. Protesters gathered on Nov. 29 at the intersection of Powell and Market Streets in downtown San Francisco to take a stand against the U.S. provocation and in solidarity with the Korean peoples. Participants marched in a picket line chanting: "No New Korean War! U.S. Out!" Speakers included Christine Ahn of the National Campaign to End the Korean War, Richard Becker of the ANSWER Coalition (Act Now to Stop War and End Racism), Steph Lee of HOBAK (Hella Organized Bay Area Koreans), Dr. Henry Clark of the West County Toxins Coalition, Gloria La Riva of the Party for Socialism and Liberation and David Ewing of U.S.-China People's Friendship Association. A solidarity statement from Veterans for Peace was read by ANSWER activist Bill Hackwell. Jamaesori ("Sister Sound”), a group of women and transgender people of Korean descent who use traditional Korean drumming to support social justice movements, performed in the opening and closing of the rally. Frank Lara of the ANSWER Coalition emceed the event. The message was clear: We must stand in solidarity with the Korean people in their demands for a peace treaty, and fight against U.S. provocations and imperialism. Demonstrators rallied on Nov. 29 at the busiest corner of Koreatown in Los Angeles in an emergency response protest to oppose escalated U.S. threats targeting Korea. Additional speakers included Ian Thompson of the ANSWER Coalition, Paula Solomon of the Coalition in Solidarity with Cuba, Arturo Garcia of Alliance for Just and Lasting Peace in the Philippines and representatives of the Korean Institute, March Forward!, Bus Riders Union, BAYAN and IAC. The Party for Socialism and Liberation delivered a solidarity statement in Spanish, directed at the many Spanish-speaking workers in the area.